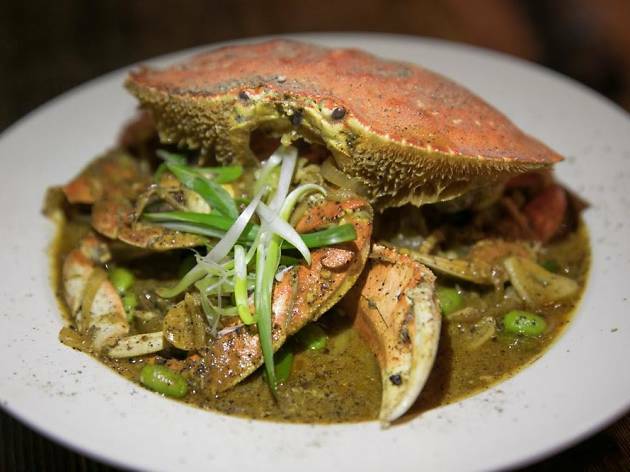 Crab season is now in full effect and sweet Dungeness crab is everywhere. 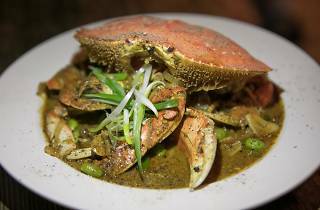 While there’s nothing like cracking fresh crab with lemon, melted butter and a good bottle of wine, here are five local restaurants who are putting a creative spin on the seasonal dish. Pesce e Riso chef Joe Lin already pushes the envelope at the four-month-old restaurant with a Japanese-Italian menu (think arancini tuna rolls or udon ai frutti di mare). The restaurants celebrates Dungeness crab season with a three-course, $45 prix fixe menu (available as long as crab is in season) featuring dishes like peppery miso black peppercorn crab. Oakland's newest watering hole, The Kon-Tiki is a playful oasis for exotic food and cocktails. Chef Manuel Bonilla (formerly at Hawker Fare) serves massive pupu platters with a savory-sweet crab rangoon dip oozing with crab, shrimp, sweet chili sauce and smoked cheddar, scooped up with fried wonton skins. Foxsister is modern Korean food set to a hip-hop soundtrack (and featuring frozé slushies). Chef-owner Brandon Kirksey plays with traditional Korean japchae (sweet potato cellophane noodles) by tossing them with lots of Dungeness crab and bok choy. Chef Kim Alter’s superb tasting menu at Nightbird currently includes the bounty of crab season with a lush crab rangoon-inspired pasta filled with crab and leeks and swimming in lobster jus.